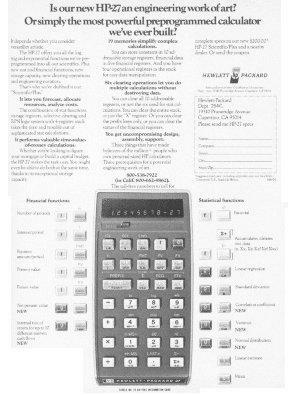 The HP 27 was a handheld scientific LED display calculator introduced in 1976. This advertisement appeared in the June 1976 issue of Popular Electronics. Caption: Is our new HP-27 an engineering work of art? Or simply the most powerful preprogrammed calculator we've ever built?